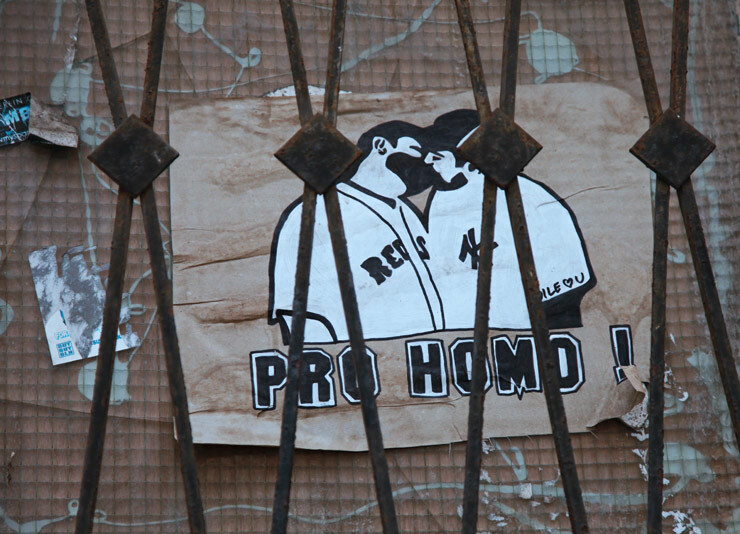 Berlin streets are regularly teeming with the Vox Graffiti in shouting chaotic profusion – and have been for decades. The bubbling laughing raging hordes proffer a visual conversation that often roars, and you’ll have to yell to get your voice above the rest. 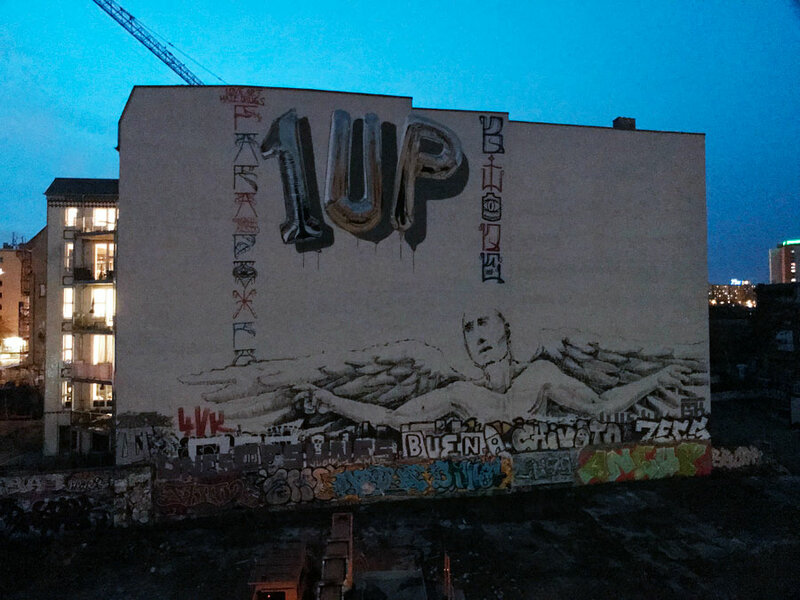 1UP and Berlin Kidz are two of the graffiti crews who reliably blast out their viewpoint, each with a uniquely unmistakable cadence and flair. This week one gilded the urban stage while the other was transformed upon it by British guest star Fanakapan with a ringing whoop, and with the angelic welcome of Alanis at the entrance, the Frühling party of Berlin is in full bloom. 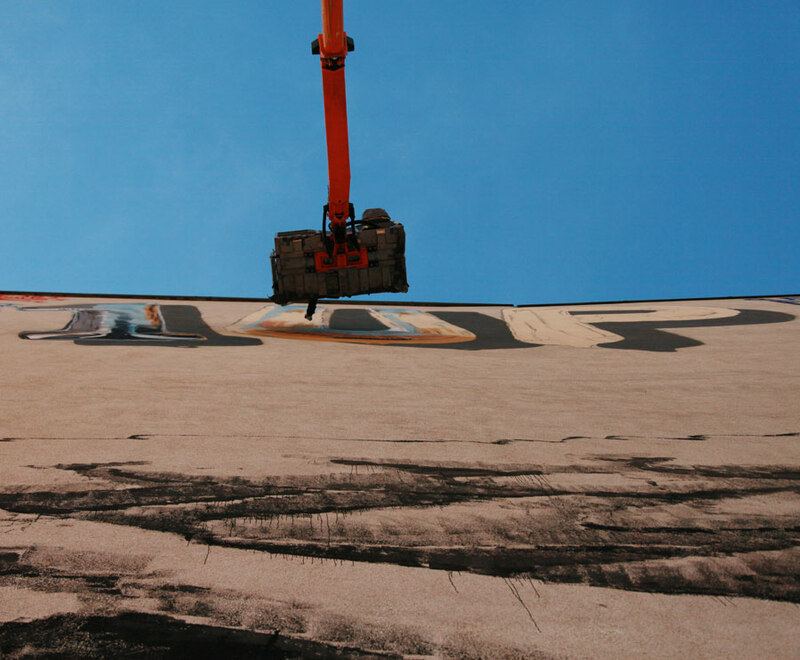 Set upon a newly opened urban arena in Kreuzberg (thanks to the demolishing of a building adjacent to it) the actual bubble letters that distinguish the guileful Londoners’ letter style now rise above the rubble with multi-colored glee. Spelling out the 1UP letters in a way they never could, his interpretative take is framed by two runners of Berlin Kidz translation of Pichaçao-style colored cryptic tagging. “As one can imagine this was just to good to be true,” says Sam Walter of YAP Productions, the organizers and facilitators of the lift and permissions. “Yes we did have problems with a security and also police since we had no official paper which gave us permission for the wall – but we got a couple of confirmations via phone calls,” he says with all the reassuring confidence of a Cheshire cat . Together with the rest of the steel-spined-velvet-clad YAP posse, the 1UP crew and Fanakapan were celebrating on this vast muddy lot ringed in concertina wire as the sun set one night this week. Word spread quickly and the reunion at the wall felt like 50% Graffiti God magic mixed with 110% adrenaline helping everyone ignore the psychotic spring weather that warms you one minute and converts you into a popsicle the next. “No animals, plants or 1UPs were harmed during this production,” quips the charismatic cultural curator and YAP team member Denis Leo Hegic as he texts process shots of the wall to the squad as the secret/public wall goes up. 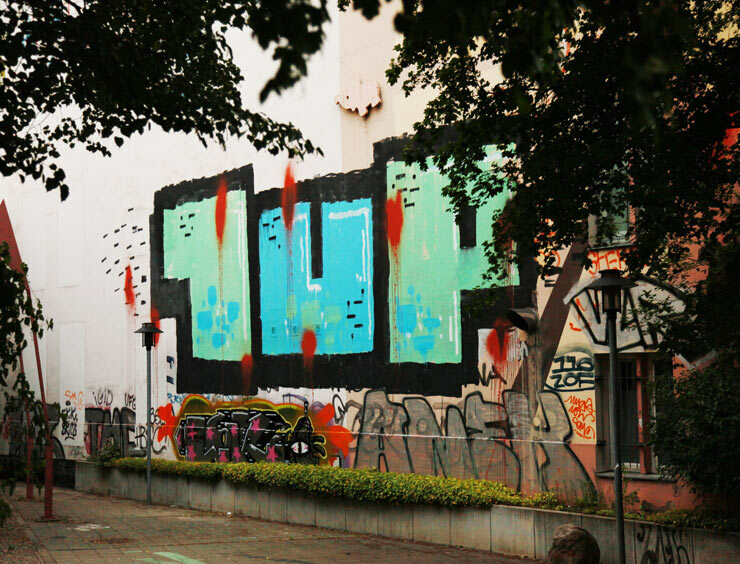 “1UP carries the zeitgeist of Berlin out into the world like no other contemporary collective. The DNA of the crew is rooted in the streets of Kreuzberg, but the group also developed into a global family,” he says. The statement is only partial bravado, as a serious graffiti head in many cities will be able to tell you a rooftop, elevator, or train line that they’ve seen hit by the amorphous and amazingly anonymous crew that seems to shape shift and reconstitute itself – evidenced here where their enormous tag is painted by another artist entirely. BSA: Is this a tribute piece to 1UP or is it a collaboration? Denis Leo Hegic: It’s gravity graffiti. Collaborative and collective work is already included in their spirit “one united power”. 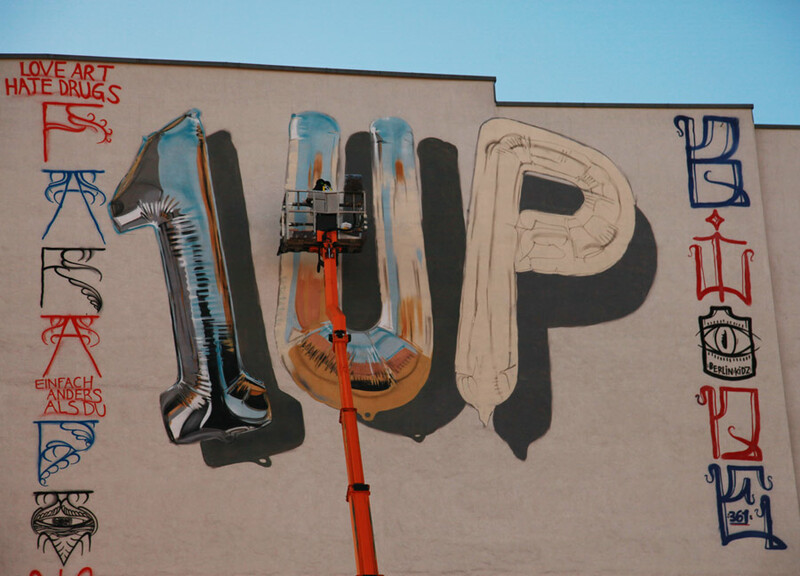 Fanakapan managed to portray it in such a powerful and gravity defying way and gave us the largest 1UP letters hovering weightlessly over Berlin. 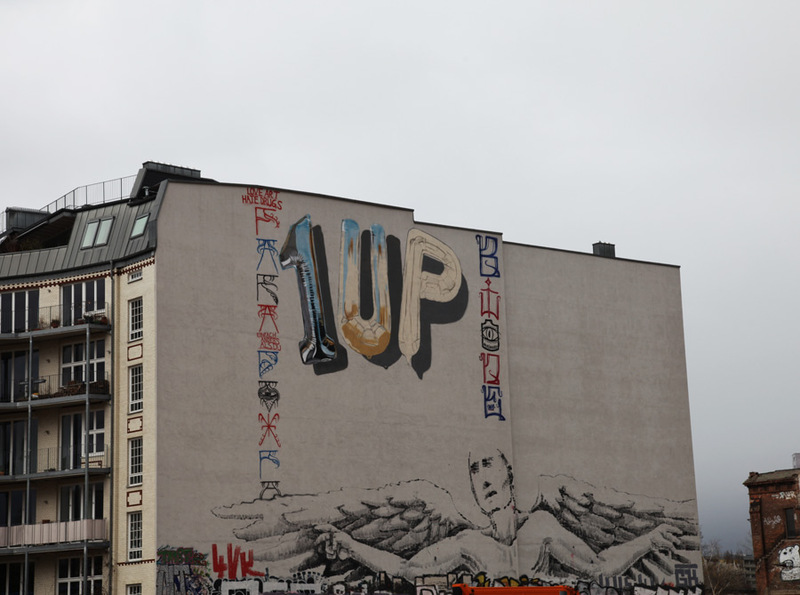 1UP is a ubiquitous tag in Berlin. You can’t help but be aware of it. BSA: Did the authorities take any interest in visiting the site when Fanakapan was painting the tag, perhaps thinking that it was actually 1UP painting? Denis Leo Hegic: We had quite an interaction with the local law enforcement. However, all the officers that appeared on site were being alarmed by other people and did not come on their own initiative. BSA: How did you get permission to paint on this wall? Denis Leo Hegic: Through the intelligence of many. We managed to thrill lots of good, curious and courageous people who made everything possible: from a large wall in the center of Kreuzberg to the entire production. Fanakapan was extremely motivated and he literally blew those balloons up the wall. BSA: Previously there was a building in front of the current wall. 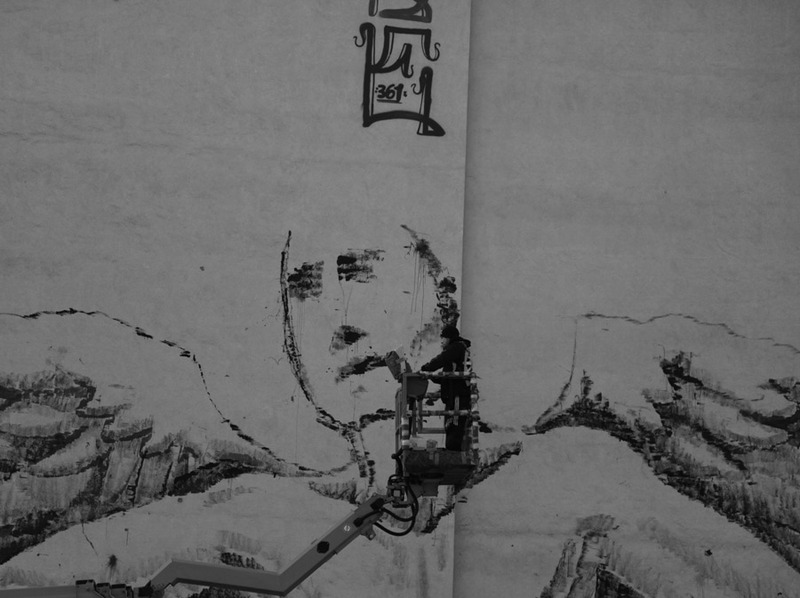 Now the whole wall is fully exposed, showing fully the long-running Alanis angel piece. Was any consideration given to the Alanis piece while planning the 1UP piece? Denis Leo Hegic: Absolutely. 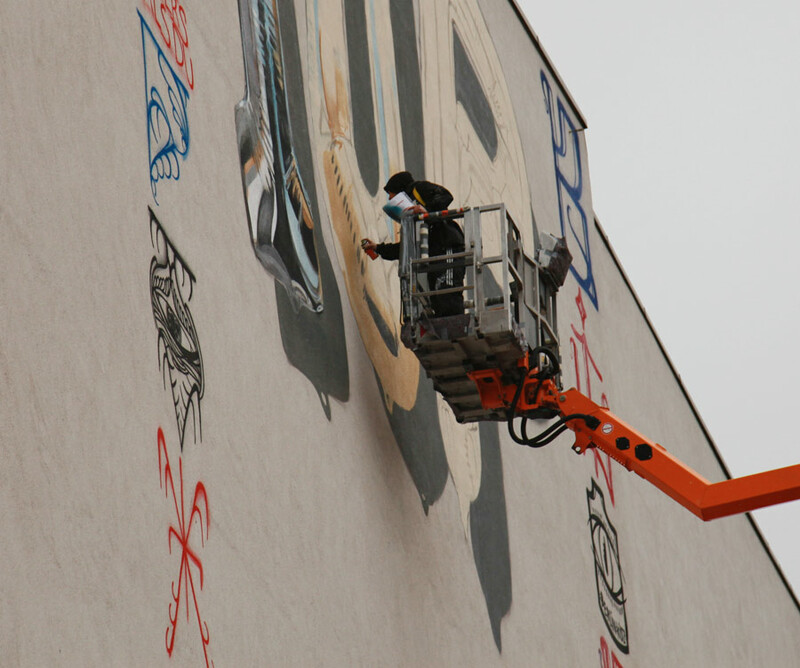 I hate when some people say “curating a wall” or “curating a mural” – that’s such utter nonsense! How can one person possibly “curate” one single painting on one single wall? However, this wall succeeded to curate itself naturally. It’s a great composition with the two vertical stripes by Berlin Kidz on each side of the piece and being held by the Alanis angel from the ground. With Fanakapan’s addition of the 1UP bubble tag it became a marvelous “Kreuzberger Mischung” (Kreuzberg Mixture).